Effortless and comfortable, upstairs and downstairs. More mobility and quality of life – c-max, the push wheel chair with stair climbing function allows you to overcome virtually all obstacles at home and on the road. The care attendant needs little physical power to handle the c-max. 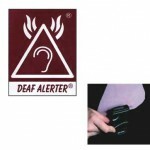 The device can be operated effortlessly and safely. Physically disabled persons are transported safely and comfor- tably up- and downstairs. You manage everyday situations without involving the assistance of a third person. On stairs as well as on level ground c-max proves its versatility. Removable arm rests make easy shifting from one chair to another possible. Due to its compact dimensions and foidable foot rest, the c-max is easy to manoeuvre even on very narrow stair cases or winding stairs. For small, packed apartments witr narrow doorways, the c-max represents the ideal solution. The c-max is an aid that allows you to master stairs effortlessly. All kinds of floor coverings such as wood, stone, metal, carpet or PVC flooring can be driven on without problem. For years this sturdy climbing system has proven itself thousand-fold in daily use. The patented climbing system eliminates damage on stair edges and floor cove- rings. Individually adjustable hand grips make sure the attendant’s driving position is ideal, which ensures careful and safe driving upstairs and downstairs. 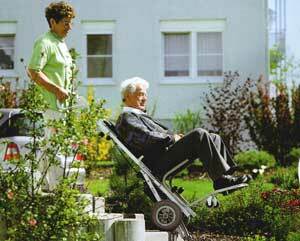 A thought-out safety concept provides maximum comfort in handling the device as well as in operating it on stairs. The c-max’s safety brakes stop auto- matically on the edge of each step. The additional single step mode guarantees an even easier handling. The individually adjustable clim- bing speed enables you to adapt to respective situations while driving. With one charge of the maintenance free batteries the c-max climbs up to 30 levels depending on the person’s weight. The S-Max; A newly developed powered climbing system with low load alternation for easy and safe handling. The s-max is applicable to virtually all commercially available wheelchairs. 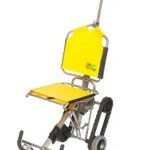 The climbing system s-max can be mounted quickly and easily to a wheelchair with fixtures due to its modular concept. It has a strong individually adjustable handle with a solid connection to the climbing unit. Electrical cables run inside to avoid potential damage. A thought-out safety concept with automatic safety brakes that stop on each edge of steps or stairs make the s-max a uniquely safe device. 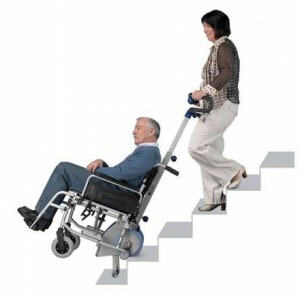 Move easily and quickly, up and down stairs in your own wheelchairs. s-max fits virtually all commercial wheel-chairs, even particularly narrow children’s wheelchairs. The brackets especially developed modular concept makes a simple assembly possible. s-max is easy to handle because of the newly developed climbing system with little load alterations. The handle’s solid connection to the climbing unit provides a secure feeling for stair climbing. The grips and control unit are constructed according to the newest ergonomic insights. The climbing speed can be specifically adjusted to the particular climbing situation at hand. The single step mode offers optimum ease in controlling the s-max to ensure safe as well as careful movement over all kinds of stairs. The s-max’s thought-out safety concept includes brakes, which stop automatically at the edge of each step. Since the s-max works with merely one climbing leg, it is particularly compact and thus functional even on narrow stair cases or winding stairs. s-max is suitable for all floor coverings, be it wood, stone, marble, tiles or carpet. The exposed edges of stairs are not damaged. Durable and maintenance-free batteries provide energy for up to 300 steps. The electrical wires run inside protecting them from damage. Thanks to its compact measurements and its low weight s-max is your ideal partner in everyday life.